SAN FRANCISCO, May 21, 2018 – Semtech Corporation (Nasdaq: SMTC), a leading supplier of analog and mixed-signal semiconductors and advanced algorithms, and machineQ™, Comcast’s enterprise Internet of Things (IoT) service, are the first corporate co-sponsors of City Innovate’s Startup in Residence (STIR), a program guiding city government agencies in developing IoT user-centered products and services. STIR connects municipalities into the 21st century while solving challenges facing cities and improving the lives of their citizens, including reducing parking congestion, monitoring waste management and controlling street lights remotely. Semtech and machineQ are delivering IoT connectivity based on the LoRaWAN™ open standard and the collaboration with City Innovate helps accelerate this goal. 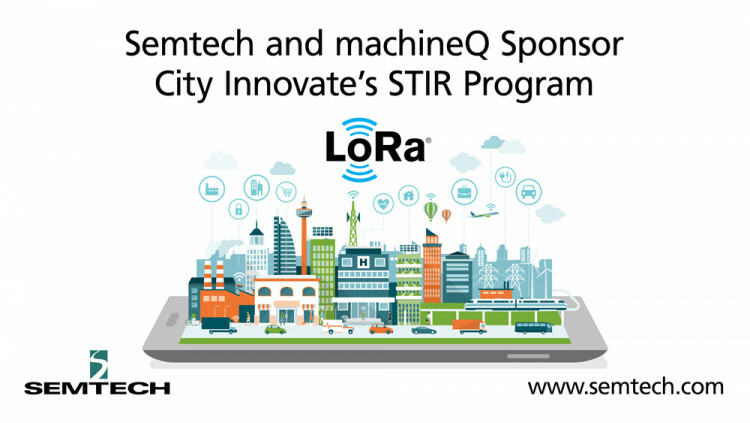 STIR provides city governments the opportunity to leverage Semtech’s LoRa® devices and wireless radio frequency technology (LoRa Technology) and machineQ’s LoRaWAN-based wireless network to develop long-range, low-power IoT applications. Each startup that signs up for STIR will be embedded inside a city agency for 16 weeks to co-design a solution, which will be unveiled during a Demo Day and live-streamed worldwide. City Innovate with the City of San Francisco and Bridge SF will be hosting the first Demo Day during Bridge SF 2018 from May 22 - 24. MachineQ™ recently activated its LoRaWAN™-based IoT network in the San Francisco Bay Area, enabling startups and developers and to connect their IoT solutions to the cloud using its network. With almost one million inhabitants, the city of San Francisco is poised to mass transform community services that addresses local challenges. City Innovate is headquartered in San Francisco and works extensively within the city to deliver the benefits of IoT technology. Startup in Residence (STIR) connects startup companies with government agencies to develop technology products that solve real civic challenges. During the 16-week program, startups use a streamlined procurement process to develop solution for government agencies with an expedited pathway to implementation. Government agencies get their problems solved faster, with mitigated risk, while startup companies gain access to potential customers and leaders in the government market. For more information, visit startupinresidence.org. City Innovate helps government address and navigate complex urban technology challenges. Our mission is to help develop user-centered products and services for the 21st century by connecting government with the private and academic sectors. City Innovate allows city leaders to build frameworks around data-driven policy decisions, and help scale these frameworks so government can deliver services effectively and efficiently to more citizens. For more information, visit cityinnovate.org. machineQ, a Comcast enterprise service, leverages connected sensor, network, and software technologies to provide end-to-end connectivity for innovative IoT solutions. The company’s flagship product is a Low Power Wide Area Network (LPWAN) driven by LoRa wireless technology. LoRaWAN is an open global standard for secure, carrier-grade IoT connectivity. machineQ removes the complexity of building and connecting to a secure IoT network, giving both IoT solution providers and end-users the freedom to focus on delivering innovative solutions. For more information, visit machineq.com. All statements contained herein that are not statements of historical fact, including statements that use the words “will,” “to accelerate,” “to develop,” “to leverage,” “potential, to,” “help realize,” “poised to,” “designed to,” or other similar words or expressions, that describe Semtech Corporation’s or its management’s future plans, objectives or goals are “forward-looking statements” and are made pursuant to the Safe-Harbor provisions of the Private Securities Litigation Reform Act of 1995, as amended. Such forward-looking statements involve known and unknown risks, uncertainties and other factors that could cause the actual results of Semtech Corporation to be materially different from the historical results and/or from any future results or outcomes expressed or implied by such forward-looking statements. Such factors are further addressed in Semtech Corporation’s annual and quarterly reports, and in other documents or reports, filed with the Securities and Exchange Commission (www.sec.gov) including, without limitation, information under the captions “Management’s Discussion and Analysis of Financial Condition and Results of Operations” and “Risk Factors.” Semtech Corporation assumes no obligation to update any forward-looking statements in order to reflect events or circumstances that may arise after the date of this release, except as required by law. Semtech, the Semtech logo, and LoRa are registered trademarks or service marks, and LoRaWAN is a trademark or service mark, of Semtech Corporation or its affiliates. MachineQ is a trademark or service mark of Comcast Corporation or its affiliates.